Rewarding Times have teamed up with Renvyle House Hotel to offer you a 3 night stay & get 4th night free Bed & Breakfast. 2 Dinners in our Award Winning Roisin Dubh Restaurant. Oyster Tasting & Glass of Prosecco on arrival. 2 Hour Cookery Demonstration with tastings. (Tuesday Morning). 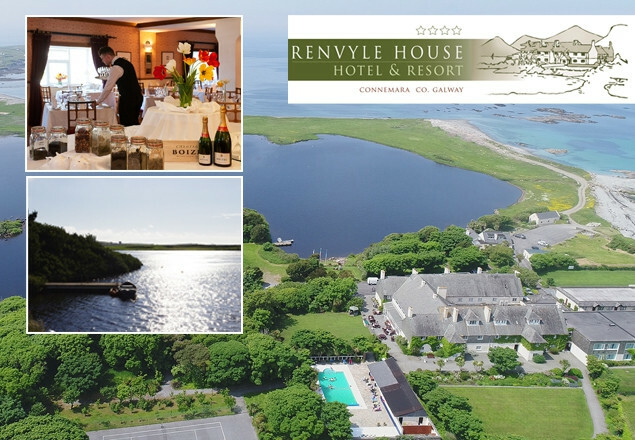 Renvyle House Hotel is a 4 star, 70 bedroom property, located on the shores of the Wild Atlantic Way, 15 minutes from Kylemore Abbey & 20 minutes from Clifden. The hotel has it’s own private beach & private lake for fishing with heated outdoor pool in the Summer months. The 150 acre estate has an extensive herb garden, rose garden, forest walk and more. Previous owner was Oliver St. John Gogarty so there is a wonderful literary history attached to the hotel. It is where W.B Yeats honeymooned and spent many happy times! In April this year, the hotel received an award for “Best Hotel Restaurant in Connacht” with Good Eating Guide awards and has achieved many awards over the years for it’s wonderful food. The Autumn and Winter at Renvyle is a fun time with various activities and events happening including a Walking Festival, Painting Breaks, Seasons Eating Cookery Courses, Brush up your Bridge, French Connection Wine Weekend and wonderful Christmas packages. Renvyle has always been known as a “Stress Free Zone”, something that is reflected in the warm hospitality and relaxed atmosphere in a unique setting on the shores of the Wild Atlantic Way. Terms & conditions apply to above offer. Valid Sunday – Thursday, subject to availability.